Adult borers—slender long-horned beetles—emerge from hibernation in the soil at the base of these shrubs, climb up stems, and lay eggs under the bark. On hatching, the young larvae bore into the stem and then turn downward, headed for the soil where they’ll spend the winter. Everything above the entry point on the stem will gradually wilt away. In addition to rhododendrons, the stem borer, Oberea myops Haldeman, also attacks azaleas, mountain laurel, and blueberries. 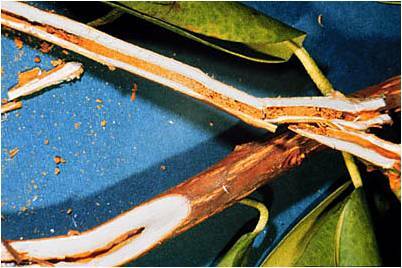 It is alternately called the rhododendron stem borer, azalea stem borer, or blueberry stem borer, depending on host plant affected. Rhododendron stem cut away to show tunnel of stem borer, Oberea myops Haldeman. Symptoms to look for include a small hole in a stem and frass—fine sawdust-like pellets—on stems, leaves, or underneath the shrub. Look above where you see the frass and you’ll find the hole where the borer pushed these deposits out of the stem. Or, worst case, you’ll see a stem with drooping leaves. These are all signals that the borer is somewhere inside the stem below that hole. From the hole, feel your way down the stem to the next joint, and with sharp pruners, cut off the section of the branch above that point. Make good, clean pruning cuts because in addition to searching for the insect, you are shaping the shrub. Look at the cut stem. If there’s no hole in the center of the stem, you’ll know that the borer is still inside the stem above your cut. However, if there is a hole in the stem, the borer is deeper than your cut and you’ll need to repeat your pruning lower down. Dispose of the cut-off stem portions in a plant disposal or burn pile. If you’ve had a history of borer problems on rhododendrons, azaleas, and mountain laurels, check your garden center for an insecticide labeled for borer control with a pyrethroid insecticide, such as permethrin or cyfluthrin. Apply after the new growth has hardened off about mid-May; apply again in early June. Be sure to read and follow the insecticide label for specific application instructions. For blueberries, pruning your plants every year in late winter is usually sufficient to control stem borers. For more information, view the North Carolina State University Azalea Pest Management Calendar at http://www.ces.ncsu.edu/depts/ent/notes/O&T/calendars/note052.html and Pruning Blueberries at https://growingsmallfarms.ces.ncsu.edu/wp-content/uploads/2016/02/Pruning-Blueberrries-25JAN14.pdf?fwd=no.